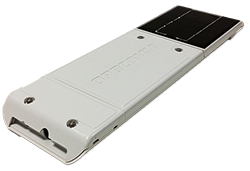 Designed specifically for trailers and general asset tracking, ORBCOMM’s solar-powered GT 1100 has a small form factor that makes it easy to install on trailers and containers to provide complete asset visibility, improve operations and lower the cost of doing business—for years without battery changes. Sealed and waterproof solar panel provides continuous power to rechargeable batteries for reliable trailer tracking. Lasts for years even in the harshest environments, providing continuous service without battery changes. Integrated with ORBCOMM’s CargoWatch® application for virtually unlimited position reports via cellular. Add satellite capability where cellular is not available. Add door and cargo sensors for added visibility.